Midland at Cambridge Junction UK. Photo Credit: Lee Abrahall. 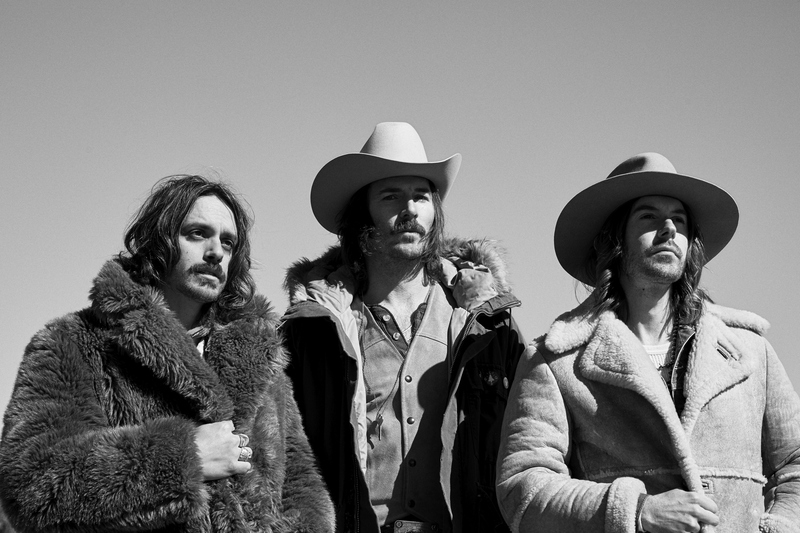 Midland is a band from Texas made up of Mark Wystrach (lead vocals, guitar), Cameron Duddy (Bass guitar, background vocals), and Jess Carson (lead guitar, background vocals). Midland signed with Big Machine Records in 2016 and have been working hard ever since; on the road; in the studio; and in 2017 released their debut album On The Rocks. Mark said they have 2 weeks off at Christmas which will be their first break in a long time. 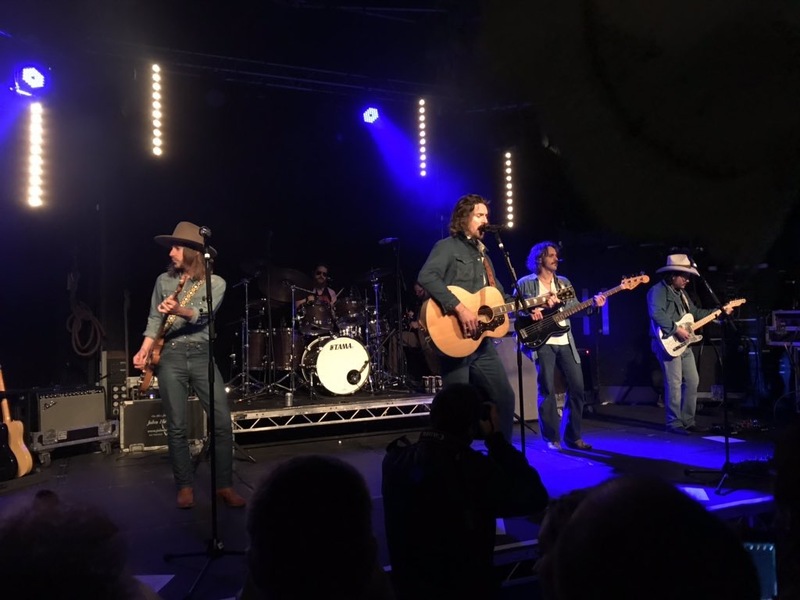 Midland played the main stage at C2C Festival in March 2018 performing at London, Dublin and Glasgow, instantly making new fans. They ended their C2C Festival time with a one off gig at The Omeara, London which I was lucky enough to get a ticket for and it was one of the top 3 concerts I have ever been to. Since then, I have been itching to see them again. I am pleased to say the wait was well worth it, Midland did not disappoint. Midland’s set included a number of hits from their debut album ‘On The Rocks’, some covers and a few new songs. With them on their return trip to the UK again is lead guitarist Luke Cutchen and Drummer (Multi-instrumentalist) Robbie Crowell. Midland kicked off their set in Cambridge to a crowd of approximately 800 with their song ‘Check Cashin’ Country’ which I feel is a perfect song for them to start off a high tempo set with. They went straight into ‘Burn Out’ which got the crowd rowdy and everyone joined in with singing along. This was a theme throughout the evening. Following on from that was Electric Rodeo. Jess then introduced themselves as being known as the ‘Gator Boys’ and sung the song with the same title which is one of my wives favourites. 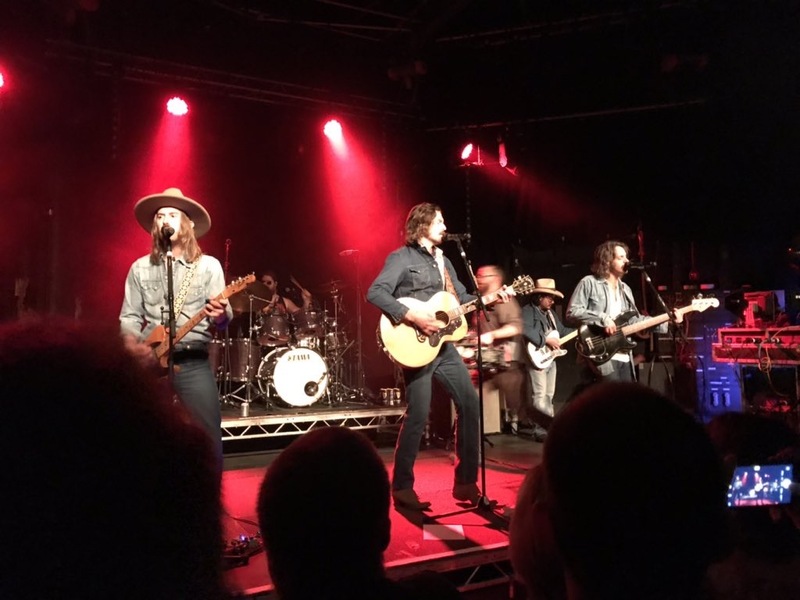 Mark then introduced a new song they have been working on; 21st Century Honky Tonk Bar which is a little gem of a song and if you are a Midland fan, you will not be disappointed with this number. Mark then introduced the next song Fourteen Gears which he said they produced at the very beginning when the band got together – they realised then that they had something special. Fourteen Gears is a fan favourite and has been hinted on being on the second album. Out of Sight was next, followed by a cover of Bruce Springsteens Tougher Than The Rest. Midlands version is available on Spotify. Sticking with Cover songs – Midland then performed their version of Miss You by the Rolling Stones, East Bound and Down (which they performed recently on the CMA awards – again their version of this song is also available to purchase) and one more cover song Midnight Rider by The Allman Brothers Band. Going back to some of their songs from their current album we were treated with Altitude Adjustment and then Make A Little before the band left the stage to a loud round of applause and appreciation. Luke later reappeared on stage and started a guitar solo of La Grange later joined by Robbie. Moments later Cameron, Jess and Mark returned to the stage and Mark introduced the band before they performed Drinking Problem which you can imagine had the crowd singing along. After this, Cameron and Robbie switched places and Cameron was on the Drums and Robbie on Bass guitar – yet again showing off how talented this band really is. The band then finished off with some more covers including Drink’, ‘I Can Get Off On You which had supporting Act Desure join them on stage, before finishing the night off with a cover version of Wicked Game which highlighted Mark’s amazing vocals. I know the guys have been working really hard and they deserve their break over the festive period, I can’t wait for their next album release. Friday 30th November at Gorilla, in Manchester. Saturday 1st December at Saint Luke’s in Glasgow. Sunday 2nd December at The Boiler Shop in Newcastle Upon Tyne. Tuesday 4th December at O2 Academy in Birmingham. Thursday 6th December at O2 Shepherds Bush Empire, London. Friday 7th December at Vicar Street, Dublin. Great concert and nice sized venue. We need a photo of the reviewer on this page as his outfit and moustache were fabulous and fitted the occasion.